Love’s truck stop is planned to go on this property on Old Salem Road off I-5 (in the background). A proposed truck stop near the I-5 interchange with Old Salem Road has caused a stir in Millersburg, where the city’s planning commission is scheduled to take up the matter on Jan. 10. 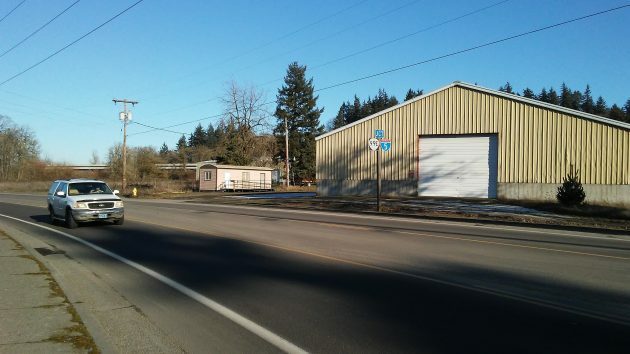 The commission will consider a site plan for a Love’s Travel Stop and Country Store, planned for a 12-acre site in an industrial zone where Old Salem Road bends eastward toward Interstate 5, just a few hundred feet from the south Jefferson interchange. According to the Nov. 11 application, Oklahoma City-based Love’s was in the process of closing on the purchase of the property, previously occupied by Universal Timber Structures. Five buildings are to be demolished to make way for a Love’s Country Store, fuel islands and parking lots. Some Millersburg residents have expressed reservations about the project in postings on Facebook, where they organized a petition that had gathered 30 signatures as of Friday. They ask that the city deny approval of the site plan or delay action until an ordinance can be passed to prohibit this type of development. Love’s application, accompanied by a $1,000 fee, says the company would like to start building in the spring and complete the project by the end of the year. It says the business will be open around the clock, and up to 15-25 employees and 75 customers will be there at any one time. A traffic study done for the applicant projects peak-hour traffic as 432 vehicles. The development is proposed at the north end of a long string of industrial and truck-related businesses on the east side of Old Salem Road. But comments on Facebook suggest that opponents fear a truck stop would detract from the family atmosphere of Millersburg’s fast-growing residential neighborhoods. A couple of postings by one contributor allude to prostitution at truck stops elsewhere. Others cite crime reports from around the country. City Administrator Barbara Castillo says the truck stop is an allowed use in the “limited industrial” zone that covers the site, and the planning commission can act on the plan without a public hearing. The city council will not get involved unless there’s an appeal from whatever the commission decides. 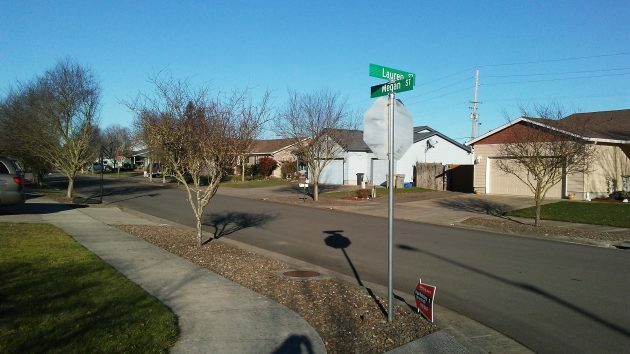 A neighborhood just west of Old Salem Road in Millersburg. I think that’s a natural location for Love’s and I believe it is needed in the Albany area. I live in Ontario now and there is Love’s here, always busy with cars and trucks fueling and resting! I think it will be a good business for Millersburg, and for Linn County. Give truckers a place to go. They don’t have a place to rest locally. I think it is a wise move I expect fewer wrecks along I-5 because tired truckers can pull in and not get told to move on because they cant park here. Will it have rv waste disposal facilities available? This sounds like a good use of the location to me, and would be a bit of welcome news to the Millersburg/Albany/Jefferson economy. The concerns cited in the article do not seem valid. I would think after losing Willamette Industries by way of Weyerhaeuser and Internationall Paper, the city would welcome this business opportunity. Jobs. Jobs. Jobs. Peoples of Millersburg, surely you like those and the commerce. Take the good with the bad. No? As a resident of Millersburg I do NOT want a truck stop going in here. I’m not against new businesses, but I am against this truck stop and what it will bring with it. Millersburg is a small, very family oriented town and I’d like to keep it that way. I feel for the drivers and do understand that they’d like a nice place to stay, but not here. We’re a police family and my husband has experience with what comes with truck stops (higher incidents of drugs and prostitution) and I don’t want our City’s standards going down the drain. We will be fighting this.